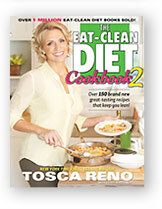 A while back, I was contacted to read/review this cookbook called The Eat-Clean Diet Cookbook 2. This cookbook is not vegan, and is one of the few cookbooks I have that is not. Flipping through the colorful cookbook (pictures are ALWAYS appeciated so that I know what I'm making), I saw there was lots of veggie-friendly recipes, which is a must for me in any cookbook. "The Ukrainian" eats meat, and there are plenty of recipes for him, too. Besides vegetarian recipes, this book emphasizes healthy meal preparation in a way that seems accessible to most people. You won't be seeing any recipes calling for nutritional yeast flakes here, but you will see things like lentil soup. A while ago, one of my favorite health food stores had a bulk bin sale, so I scooped up a bunch of (cheap!) lentils and went to town! I dissolved my last veggie bullion cube to make the broth. I tossed in some leftover broccoli. Yes, I know this looks dry. At this point, I had forgotton to add the additional 2 cups of water stated in the recipe. Luckily, I got it in, and it was salvaged! To go with this soup, I made some socca, which is sort of middle-Eastern bread made out of chickpea flour. Surprisingly, the chickpea (aka, garbanzo bean) flour was not expensive! I used a recipe from Pure2Raw. Luckily, I had some coconut oil lying around! The batter was really watery, so I couldn't shape it into pita-like pieces like I had hoped. Here's the result of 30 minutes of baking. I think I need to use a smaller pan next time, but gosh, this was tasty. I mean, you can tell it's garbanzos, but its crispiness makes it really delicious! Here was the dinner that night. On the left is a fresh-caught fish from a friend of "The Ukrainian" with some spices. It went well with the (now properly liquid) lentil soup, which was everything I expected from it given the lovely spice combo. Mmmm love lentils. This looks good! I've never had Socca! I love the cookbook and currently on that diet. I recommend the Black Bean Fudge Cake. So yummy!